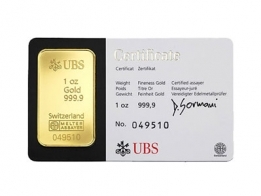 Valcambi Suisse Combi Gold Bar - 1 Troy Ounce Fine Gold 999.9. The Valcambi 1 Oz Combibar gold bar is comprised of 10 x 1/10 Oz Valcambi gold bars, which break off of each other into individual pieces. The combibar was launched by Valcambi in 2011 in response to the Euro crises. These bars are designed to be broken off and used in place of fiat money in the event that the Euro collapsed. 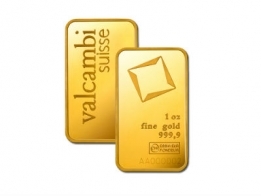 The Valcambi combibar gold bar is available in 1 oz and 50 gram sizes. It is also available in silver, platinum and palladium. 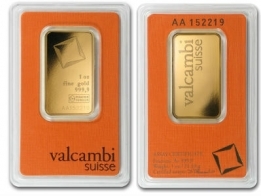 Valcambi is one of Switzerland's leading refineries, and they produce precious metals products for investors worldwide. They also produce the range of gold and silver bars sold by Credit Suisse to bullion investors. Please contact us to sell Valcambi combibars.